While your ship awaits at the cruise terminal, marvel at the ancient ruins of Orongo, a stone village and ceremonial site on Easter Island’s southwest coast. 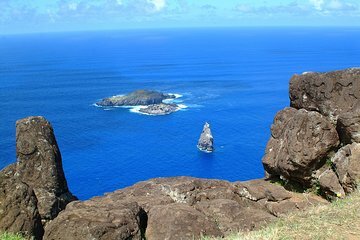 During this 4-hour shore excursion with a professional guide, you'll explore a mysterious civilization at the Tahai archaeological complex in Rapa Nui National Park and view the Rano Raraku volcanic crater. Round-trip port transport is included. IMPORTANT INFORMATION: Please consider that if the ship can't arrive to the destination due to the bad weather conditions and we don't have this information at last 24 hours prior the departure of the tour, we will have to charge the 100% of this booking.